The common problem with the design of the glove box liner is simple, it was cheap and cheerful to keep the costs down during production so it was made of cardboard. Anything wet on it ruined it, anything heavy in it ruined it, age ruined it. So eventually it will need to be replaced. There are plastic ones and cardboard ones. Quality varies considerably as well. First job is to remove the old one. Most of the time they just sort of fall out as the deteriorate pretty badly. The problem you will have if it’s the original is the side fittings. 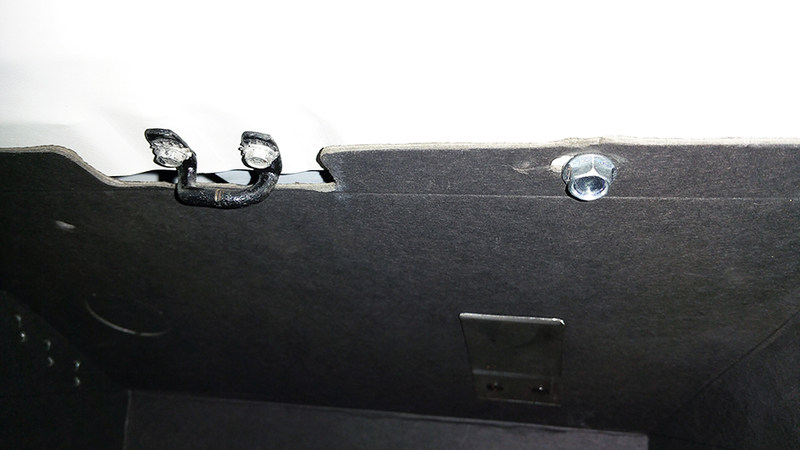 The glove box was held in place by a pop rivet. To get that out without damaging the dash will not be a lot of fun. As I have had my dash replaced I will take you through the steps anyway which will be handy if you want to replace the glove door or the striker bar at the top. First job for me is to fit the striker bar at the top, this is held in place with two self tap screws into a metal plate rectangle in shape the has two corresponding holes drilled in it for the screws. The trouble here is to fit the plate at the top. The plate is designed to move around and adjustable with elongated holes at the top of the opening. Placing the plate you have to reach up to the top and locate behind a cross brace and align it up to a hole. Align the striker bar and a screw to a hole and just take up a turn or so, this leaves plenty of room to align the other hole and screw. Once you have fitted the second screw lightly nip up as you may have to adjust it to the door closure. Next is the liner. There are two screws at the top and three at the bottom just in front of the door hinge. 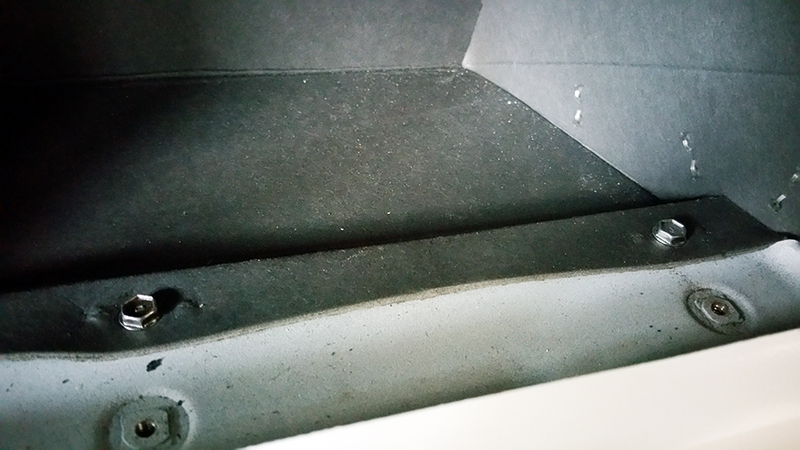 Depending on your liner design you can collapse the liner along the fold marks and just bust it through the front. Although this is the quickest and easiest way it will distort the liner shape, and of course slightly weaken the cardboard. My way to lift the box under the dash and wiggle it up into place behind the dash opening. You may also have to move some wire around or worst case drop the heater box down a bit. But this will give a crisper looking liner without any creases or bends. 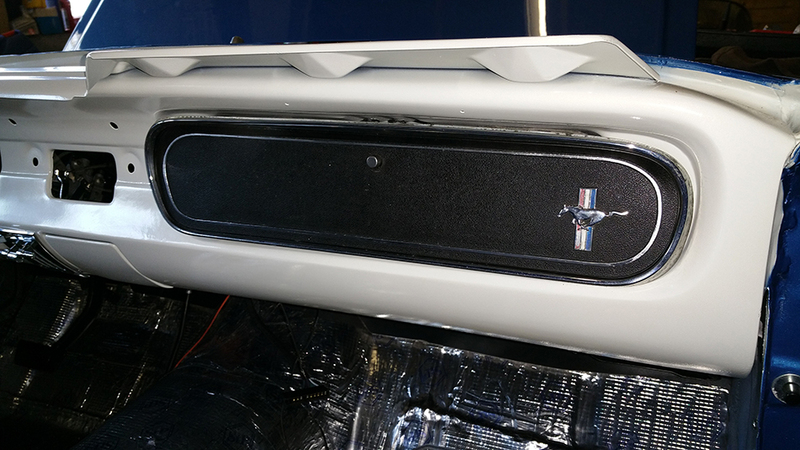 Once you have the liner in place the top lip of the liner sits on top of the dash opening. Two screws will hold the liner in place. However I didn’t realise this as my liner had no inset screw thread to hold it in place. So I had no choice at this point so I my liner sits inside the opening to cover the gap. I had to be even more careful now as jamming it against the dash will ruin the corners of the dash and you will see this leading edge. Screw in some self tapper screws or the original screws into the holes at the top to hold it in place. I used some nice chrome screws to contrast against the black liner. No matter how careful I was I still damaged it a little. I will at a later date replace it again, but for now I doubt many will really notice, besides I quite like the chrome on black look. Nobody will see it behind the door so this little difference is to a show stopper. The bottom three screws can be reused on the original dash, but for mine I had to use self tap screws and self tap nuts at the bottom. This required the dexterity of a five-year old’s hands to get in the small gap. Again light nips until all the holes are fitted. Then tighten up. I didn’t have the hinge in place for this pic so you can see the further three holes just in front for the door hinge. 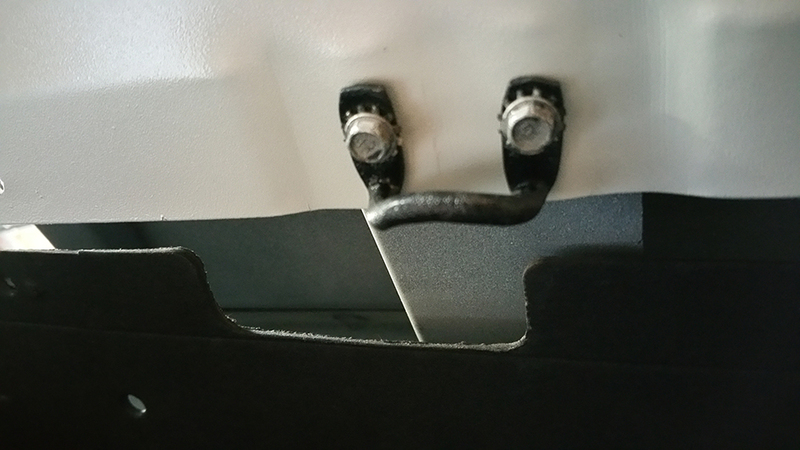 The sides of the glove box fit around the back of the dash and a two small screws will pull the sides into the dash and again close up any gaps. 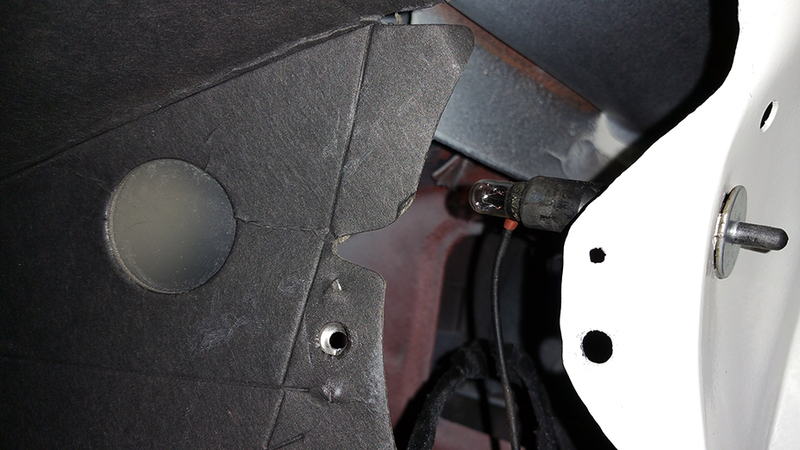 This part may be optional if you removed the hinge: Fit the hinge to the inside of the glove box opening using the three small bolts and their washers, but don’t tighten fully Yet. 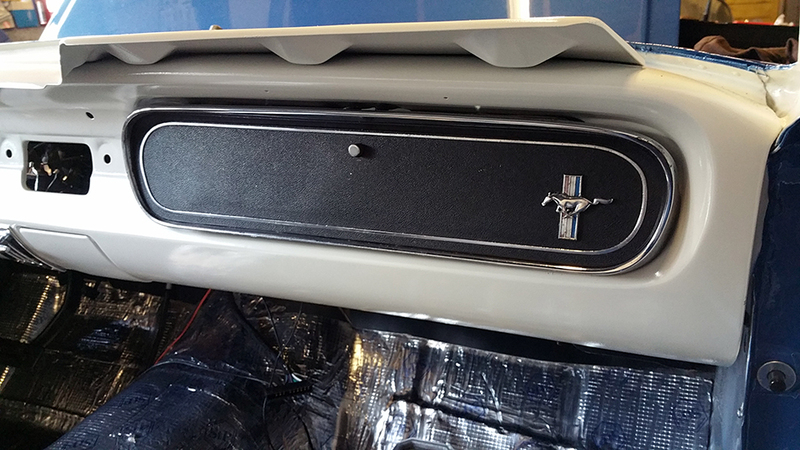 The glove box door is held in place by three small bolts into the bottom of the door that will allow for a small amount of adjustment. Attach the drop cable to the side of the dash (right hand picture above) using the small self tap screw. Slowly close the door to check that the hinge will clear the dash and the striker mechanism hits the bar and trips over the lock. You may have to adjust it all up a bit to align correctly. Once you are happy with the alignment make sure the door, hinge bolts and striker bar are all tightened up. This took me about three hours to do properly for a couple of reasons. 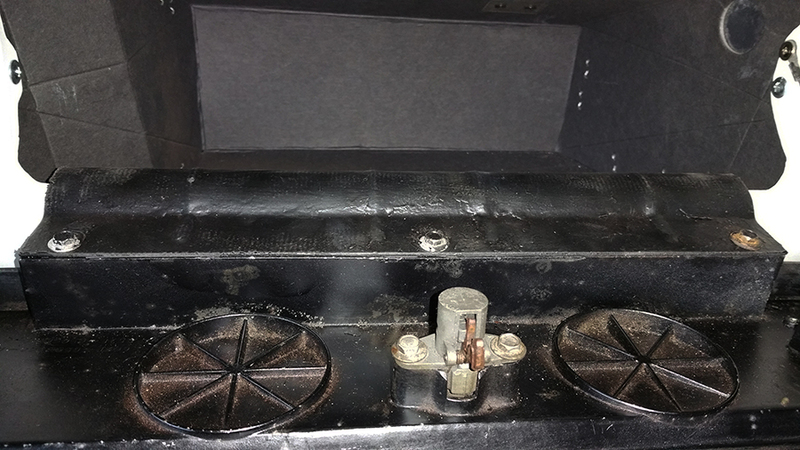 I didn’t want to collapse the liner, and I had to fit the striker bar and the retaining bolts for the bottom of the glove box. I wanted to make it look as crisp and clean-looking as I could. If you are using the original fittings I suspect this can be done in about half an hour with a collapsed liner and original fittings. There will also be no need to align things up as I had to from scratch. It fitted well but the cardboard liner is exactly that, cardboard. Any bends or creases will be seen and could ruin the desired new look. So take your time and be gentle with it is the only hint I can give you.